Remember the kids who bought weed from Jay at the beginning of Jay and Silent Bob Strike Back? Well, they're back for more in Jay & Silent Bob Reboot. Kevin Smith has been hard at work on his latest adventure in his View Askewniverse, and his first movie since suffering a near-fatal heart attack last year. Smith has been incredibly active on social media during production and his recent posts have teased several more returns and new additions. 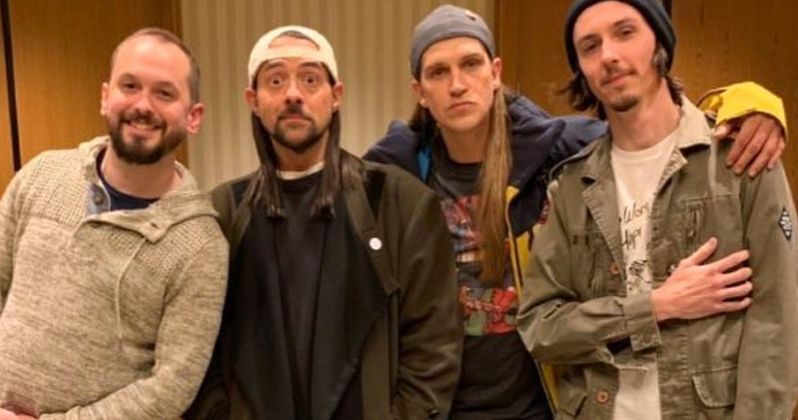 First up, Kevin Smith has revealed a new photo of Jake Richardson and Nick Fehlinger, which recreates a photo he and Jason Mewes took with the actors nearly 20 years ago. They're set to return in the upcoming sequel as adult versions of the characters they played previously. Here's what Smith had to say about it. "All this time, our dirty l'il secret is that while Jay and Silent Bob Reboot is a sequel to #jayandsilentbobrestrikeback, it's also a semi-sequel to all of the #viewaskewmovies I ever made. But last night, we extended the stories of the kids who bought weed from me and Jason Mewes at the top of Strike Back: Jake Richardson & Nick Fehlinger joined us as grown up versions of their characters! So at about 2am this morning, we found a moment to recreate a pic we all took 18 years ago! One of my favorite aspects of #jayandsilentbobreboot is seeing where all my characters are in the 2019 #viewaskewniverse! While our heroes are desperately trying to hold onto their 90's way of life, the rest of their world has moved on from them and grown up. Last time we saw Jake and Nick together, they weren't grown up yet. But last night, I shot a fun and funny scene with a pair seasoned of adult pros!" In several other posts over the past few days, Kevin Smith revealed that former SNL cast member Molly Shannon, Garfunkel and Oates star Kate Micucci, Diedrich Bader, who returns from Jay and Silent Bob Strike Back, as well as his wife Jennifer Schwalbach, are all set to appear. They join previously announced cast members such as Chris Jericho, Method Man, Red Man and Shannon Elizabeth. One new addition to the View Askewniverse is Ralph Garman, as revealed in another recent post. Garman co-hosts the Hollywood Babble-On podcast with Kevin Smith, but has also starred in some of the filmmakers more recent efforts not tied to his larger universe. Garman is set to play a big part in Jay and Silent Bob Reboot, per Smith's post. Garmy strong! Of course my Babble brother Ralph Garman is front and center in Jay and Silent Bob Reboot! Ralph and I have done 4 movies together (Red State, Tusk, Yoga Hosers and now #jayandsilentbobreboot) but this is his first #viewaskew movie! The leader of the #garmy and host of #theralphreport plays a pivotal role in the flick, helping to set in motion the #jayandsilentbob adventure this time! Many thanks to my podcasting pal for bellowing the funny and gilding our lily! Only 5 more days left to Reboot, then we can get back to our real jobs: hosts of #hollywoodbabbleon!" There are mere days left of filming, which means Kevin Smith will be heading into post-production soon. Jay and Silent Bob Reboot does not yet have a release date, but it's expected to arrive in late 2019. Be sure to check out the new posts from Kevin Smith's Instagram below.